This project article explains how to design and build a DIY bathroom mirror. The material used to build the mirror will be cherry. For my purposes the dimensions will be 34 inches wide by 38 inches high. 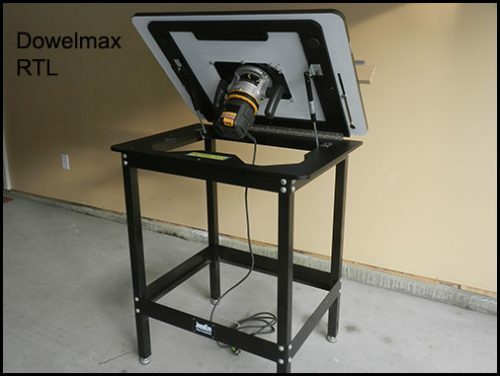 The first step is to cut the mirror rails on the table saw as shown in the following video. 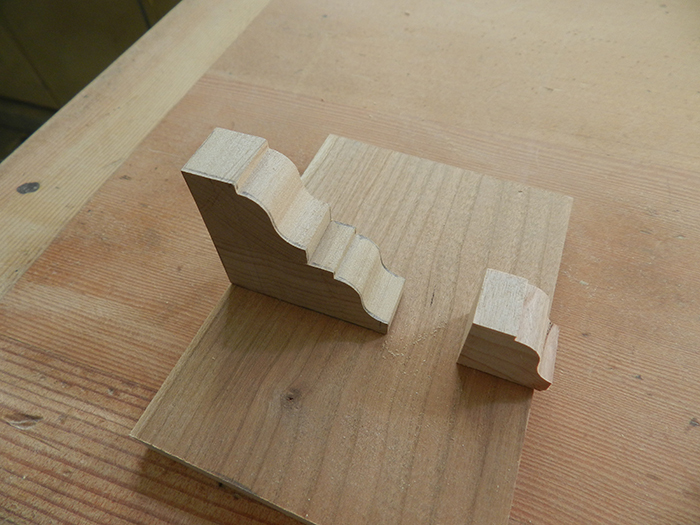 The next step is to rout the decorative rails using a carbide tipped ogee bit. The same rule applies with respect to setting, in other words, all 4 rails require to be routed at the same setting in order for the profiles to match when joined. 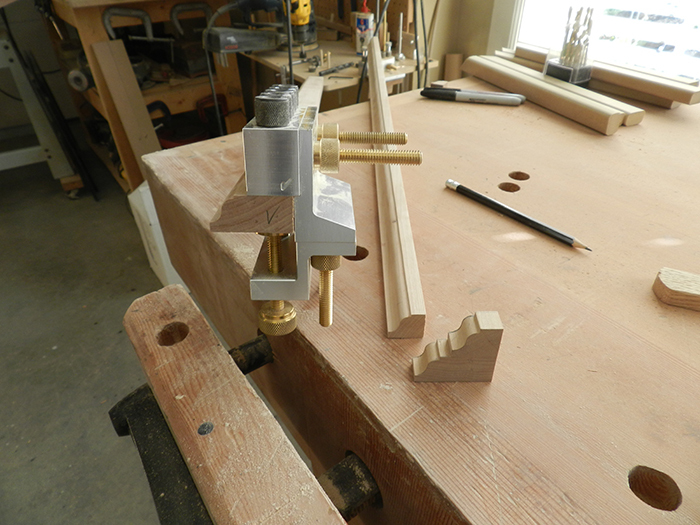 Begin by milling the 12 battens which will be routed using an ogee bit. These will form the framework for the mirror. These work pieces must be identical in width and thickness, the reason being that if these components vary in size, when routed and mitered, the joint profiles will not match. Therefore all rails, whether horizontal or vertical, have to be planed at the same time. With reference to the photograph below, the outer rail (two tier) is glued and joined to form one continuous outer rail. The inner rail being a single tier ogee profile as shown. 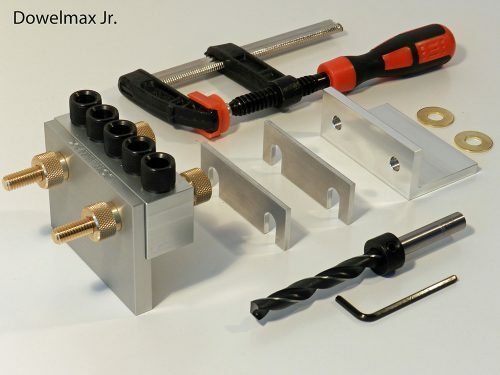 With respect to the two tier rail; the wide section measures 3/4″ x 1-5/8″ and the mating rail measures 3/4″ x 7/8″. The inner rail measures 5/8 inch x 3/4 inch. Note there is sufficient surface area to merely glue these two rails together, however as I have previously stated, alignment is critical in order to match profiles when joining. 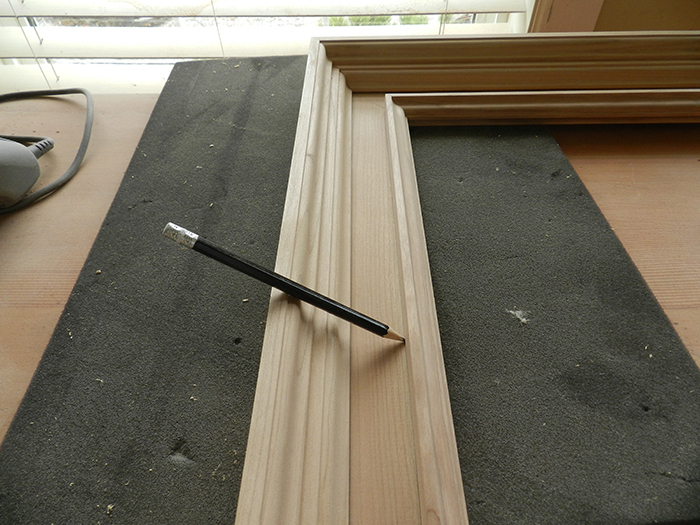 Therefore, in this case, I have decided to use 1/4 inch dowels along the length of the rails. Reference from the top end in both cases and in order to avoid fouling when cutting the miters, begin by drilling guides 4 and 5. Insert the distance gauge set at approximately 5 1/2 inches, depth of drill, 1/2 inch +. Refer to checkmarks. 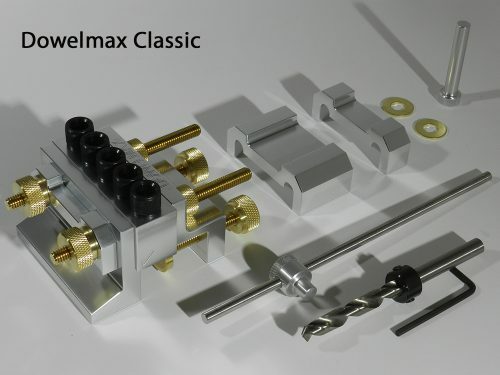 Note: in the case of the larger profiled rail, Dowelmax is altered to the face joint configuration and the end of the wooden rail is referenced to the center guide block (not the reference bracket). Set drill collar to 2 1/4 inches (shoulder and not point of drill). Drilling Small Outer Rail Using Off Cut of Ogee Profile. For the smaller rail component of the two tiered outer rail, Dowelmax is used in it’s normal configuration, and I found it advantageous to use an off cut of the same profile for clamping. In the case of the larger rail component of the two tier outer rail, Dowelmax is altered to the face joint configuration. In this configuration, take care to reference to the end of the rail to the center guide block, and not to the reference bracket. Care has to be taken when sanding the various profiles, in other words I like to retain the sharp corners of the ogee profile, bearing in mind the shape of the ogee profile is identical in reverse. For the final sanding I place a piece of 220 sand paper between the cropped section of profile and work piece to finish sand the rail (SEE PHOTOGRAPH). Clamping the small top rail to the face of the bottom rail can be problematic due to the small clamp contact area on the small rail. 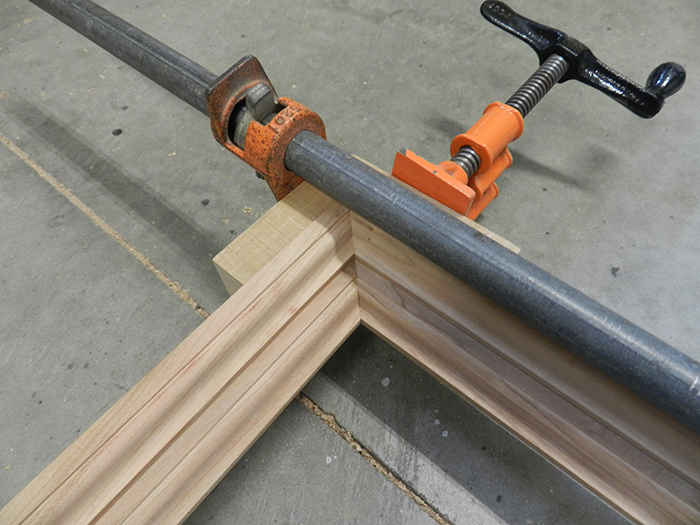 Again, since the routed profiles are identical when reversed 180 degrees, use the other routed rails (in reverse) as a means of clamping the small rail to the larger rail (SEE PHOTOGRAPH). 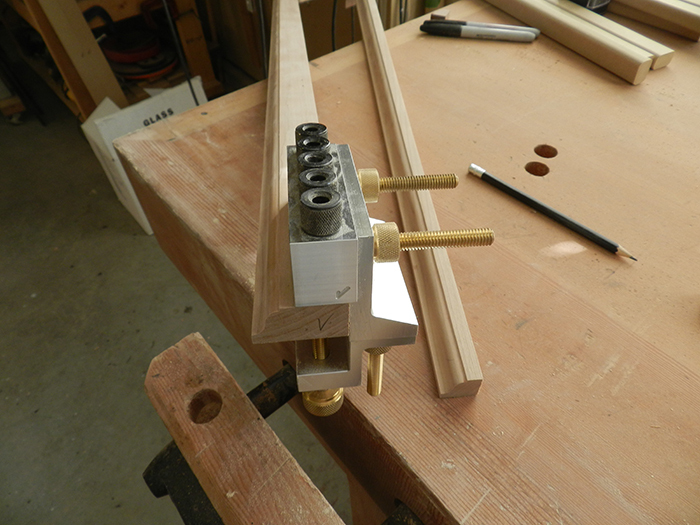 The final rail is glued, secured and clamped using small off cuts containing the ogee profile. The next step, i.e. 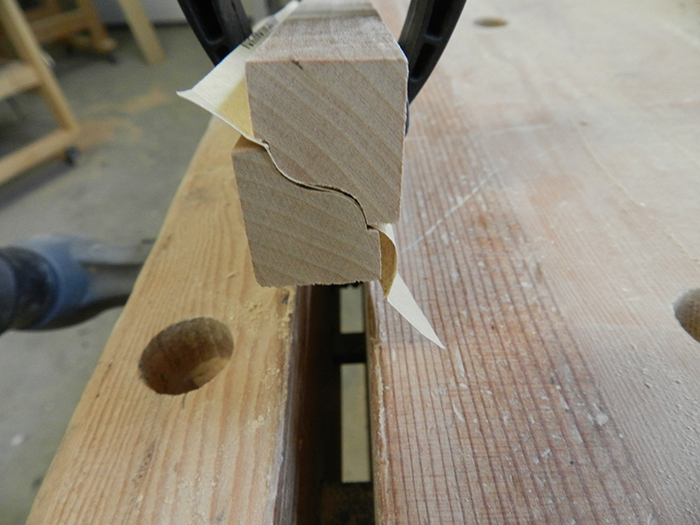 cutting the mitres is again critical with respect to accuracy and care should be taken with the set up. I begin by raising the table saw blade to the maximum height and ensuring that the blade is absolutely vertical and at 90 degrees to the bed plate (this is essential particularly with respect to the placement of dowels when joining the outer frame). Next, mill a section of wood approximating the cross section of the routed outer frame. Insert the mitre gauge in the table saw guide tracks, and using the test piece, adjust the mitre guide to provide cuts at exactly 45 degrees (I use a General digital protractor which has proven to be very accurate). If using this implement, it is essential to ensure that your initial reading of “zero” is set to be accurate and true. I found it necessary to reset the cuts using the test pieces, after changing tracks on the table saw. The next step is to align all 4 corners using dowels. I have elected to use the 1/4 inch dowels which will not only align the system, but also provide additional strength. 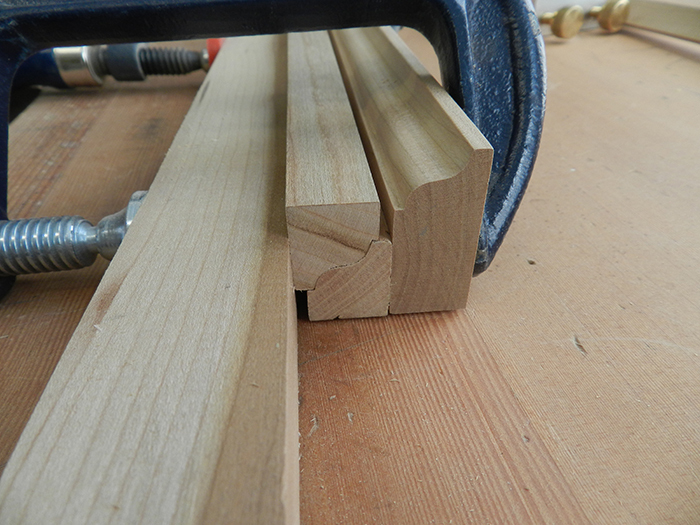 When using dowels to join the four mitered corners, with respect to a square frame, it will be noted that the dowels lie in the same axis for any two opposing miter joints. 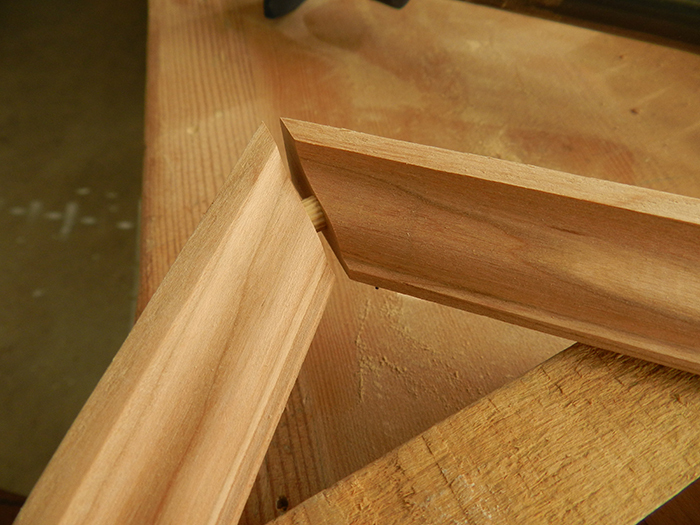 The other two opposing miters will be within a different axis. For that reason, first join the diametrically opposed corners, creating two “L” shapes. 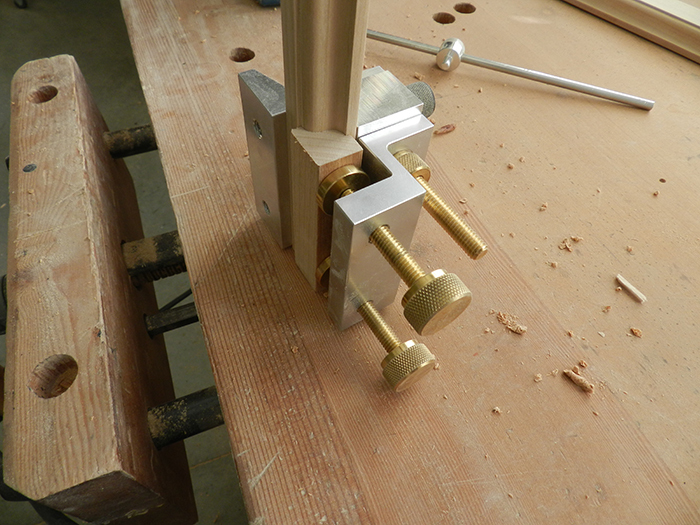 The dowels remaining to be joined will be in the same axis, and therefore the final joints can be completed. Next I made 4 x “L” shaped 90 degree clamp pads, then ranged two long bar clamps (parallel on a flat surface), onto which the mirror frame was rested. Install the clamp pads, then arrange 2 additional clamps in parallel, but in the opposite direction. Refer to photograph. 3/4 inch x 28 13/16 inch. Extreme care had to be taken with the router, due to the 5/8 inch width, and it may therefore be preferable to rout work pieces from 3/4 x 3/4 or 7/8 x 7/8 stock. 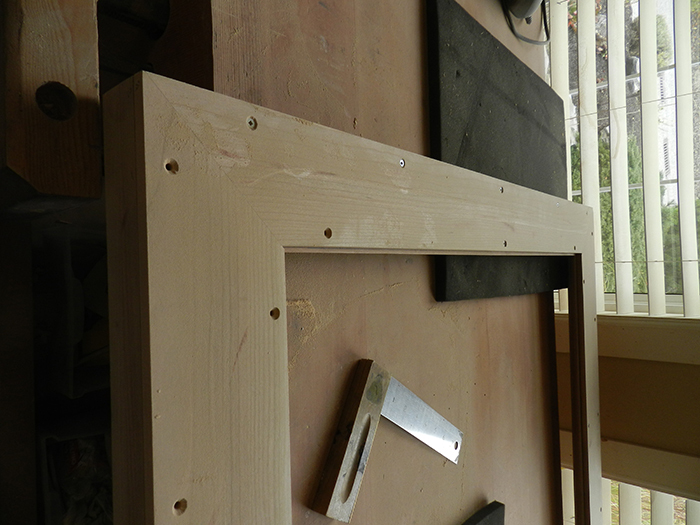 Once completed, rough sand the routed frame components and prepare to cut the mitres. 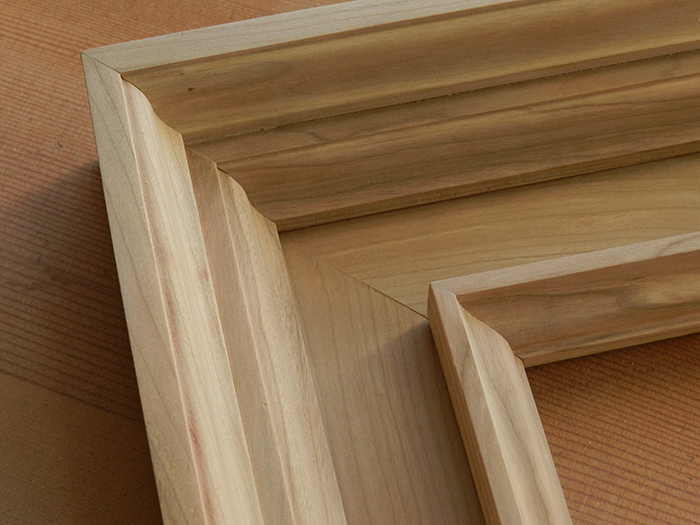 Note: as in previous cases, ensure that the width and thickness of the frame components, are identical in order to ensure that the routed profiles will match when the mitres are cut and the joints are complete. Again, use test pieces to ensure an accurate 45 degree cut before cutting the frame members. 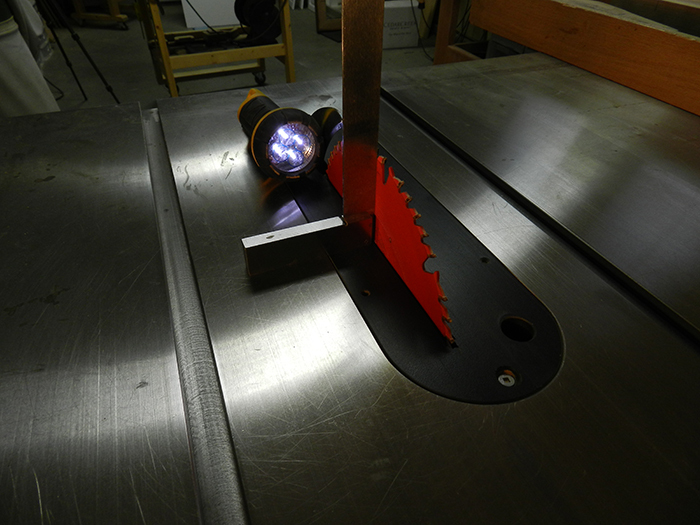 Also ensure that the table saw blade is vertical at 90 degrees to the bed plate. 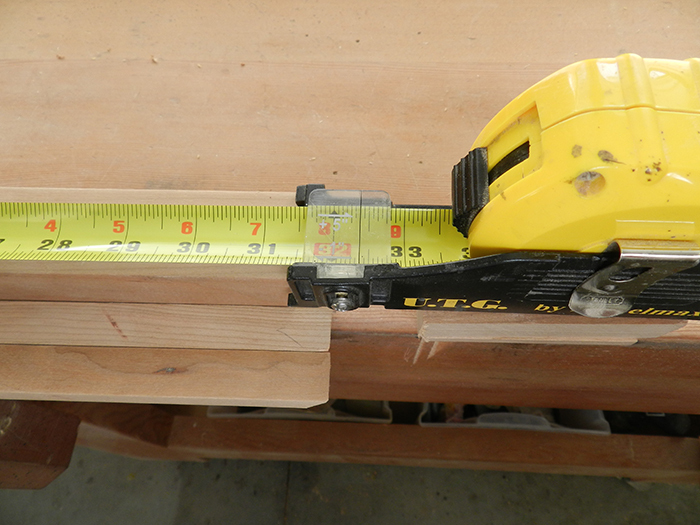 Cut the test piece on one track of the table saw until a perfect 45 degree is obtained. The basic design is as shown on photograph. Cut the corresponding rails pertaining to that track (the apex of the rail should correspond to exit point of table saw blade). It should be noted that there are 2 long rails and 2 short rails and these must be identical in length for the mouldings to match. Each time you change tracks, use the test piece to ensure the 45 degrees are perfect. Once the rear plate and the two moulded frames have been planed (where required) and sanded with 220, these moulded components can now be secured to the rear frame. A slight overlap of the rear plate where it meets the outer moulded frame, was calculated for final fairing and sanding. The smaller moulded frame is dimensionally less than the rear plate by 1/8 inch at all 4 edges (to support bevelled mirror). The inner moulded frame was positioned to provide an equal shoulder all round, and then lightly clamped to accept 3 holes at all 4 edges. Use #6 x 1 inch screws and #6 x 3/4 inch screws respectively.